For a cold store in the UK, click here. 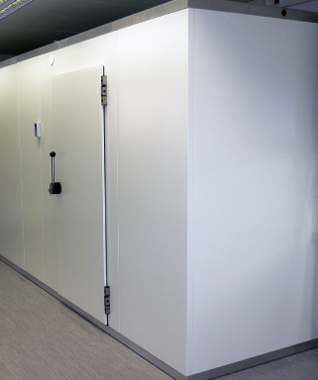 Hinged doors, sliding doors and section doors. Produced in all dimensions from stainless steel and galvanized, painted steel. 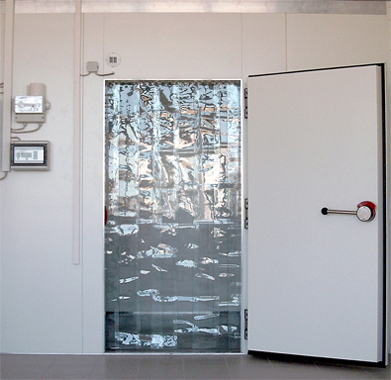 Walk-in coolers in any dimension made from insulated panels with foamed in camlocs. To be assembled easily at the site. The panels can be long up to 12 meter. So we offer to you a big program of walk-in-coolers and inform you also here about the prices. As standard coolers and freezers we offer the FRIGOBOX in 45 different sizes and for two temperatures "Polar" - 5 to +15°C or "Frost" -15 to -25°C. 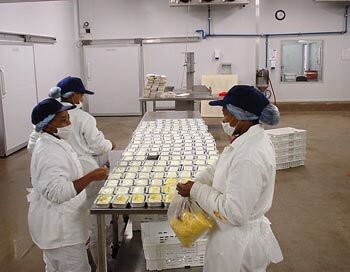 Insulated Panels for economic sandwich construction methods are also in our program. For the erection of big cold store warehouses. They can be long up to 12 meter in 8 insulation thicknesses from 45 to 200 mm. Refrigeration units ready to plug in 0,5 up to 30 HP. For cooling and freezing. In different designs as COMPACT- or as SPLIT-units. The TOP refrigeration units are mounted on the ceiling of the walk-in cooler. They leave the place inside the cooler completely free. All TOP refrigeration units are equipped with a remote control panel, which shows the temperature in the cooler and inform about different technical situations. The STANDARD refrigeration units are fixed in the wall of the walk-in cooler. Very good units for household and small business. For industrial purposes. Very robust and strong construction. These refrigeration units can be installed outside only with a protection against atmospheric agents. In opposite to the COMPACT units the SPLIT units consist of two parts - the condensing part for installation outside the cold room and the evaporating part to be installed inside the cold room. These two parts of the refrigeration unit are ready to use, i.e. tested and precharged with refrigerant. At the site they are to be connected with a connection tubing. The advantage of this design is,that the condensing unit can be situated where it does not disturb with its noise and temperature development. 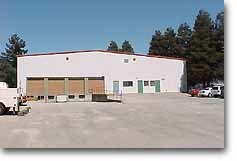 From the components of our program we erect cold store warehouses. Our strength is the fast planning and the preparation of an offer within a very short time. With the the prefab components we erect the cold store warehouses within an extremely short time. The special design gives us the possibility to sell these stores all over the world.